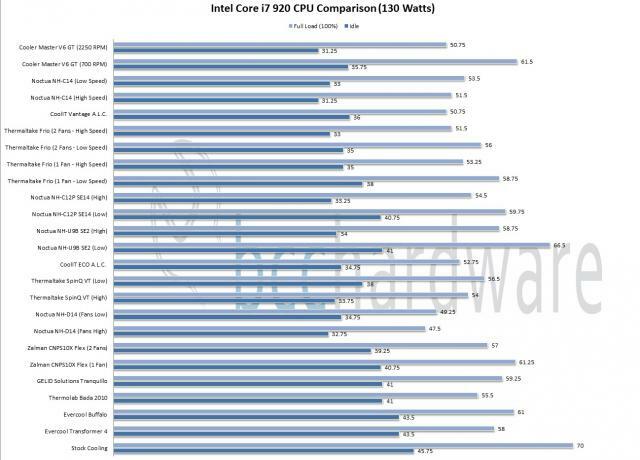 For Intel (LGA1336) testing we will be using the Intel Core i7 920 CPU, which produces 130 Watts of heat. This could be considered a mid-range processor, and while most Dual-Core processors produce ~50-80 Watts of heat, this should give you a pretty accurate estimate of what type of temperatures a cooler will provide you with. For our testing of the V6 GT we have tested this cooler at both Maximum and Minimum speeds (800 RPM and 2200 RPM). This cooler features PWM which will automatically adjust fan speed based on CPU temperatures, however, for our testing we have set the fan speed to a set speed to show what this cooler is capable and to easily compare it with other coolers on the market. At low speeds the V6 GT is nice and quiet and still offers almost a 10 degree reduction over stock cooling. In our testing we've used one of the hottest CPU's available so for most "lower wattage" CPU's chances are good this cooler would probably not have to run much over 700 RPM to keep up (even with a 140 watt CPU it was able to easily keep up with our CPU). 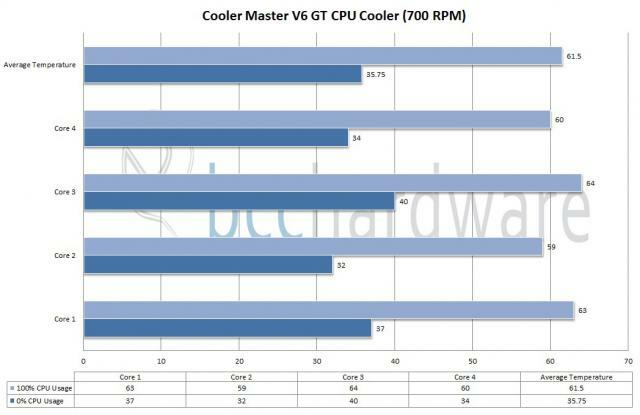 At full speed the performance of the V6 GT is pretty impressive and is able to keep up with most of the other coolers we've tested. Unfortunately at full speeds there is a fair amount of noise so if you want max performance you will have to deal with the noise. The V6 GT is a PWM controlled cooler so the majority of the time you'll never even get close to max speed so noise probably won't be an issue for most users. 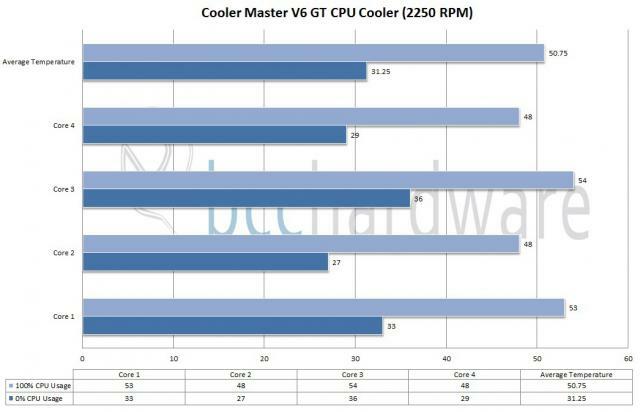 As you can see in the last chart when compared to the other coolers we've tested the V6 GT was able to keep up with the best when running at full speeds. When running at full speeds this cooler is a bit nosier than others we've tested so if you are the type of user who wants maximum performance you might be a bit annoyed at the noise. Overall I'd say the performance of the V6 GT is good and even when running at the lowest fan speeds possible we were able to easily keep up with our hot Intel i7 CPU without any issues.